It’s Word Study Wednesday and we are still in the book of Ephesians. I can’t possibly cover 2 chapters in one day so I included some of this lesson in my post yesterday, please take a look at “Put On, Put Off“. 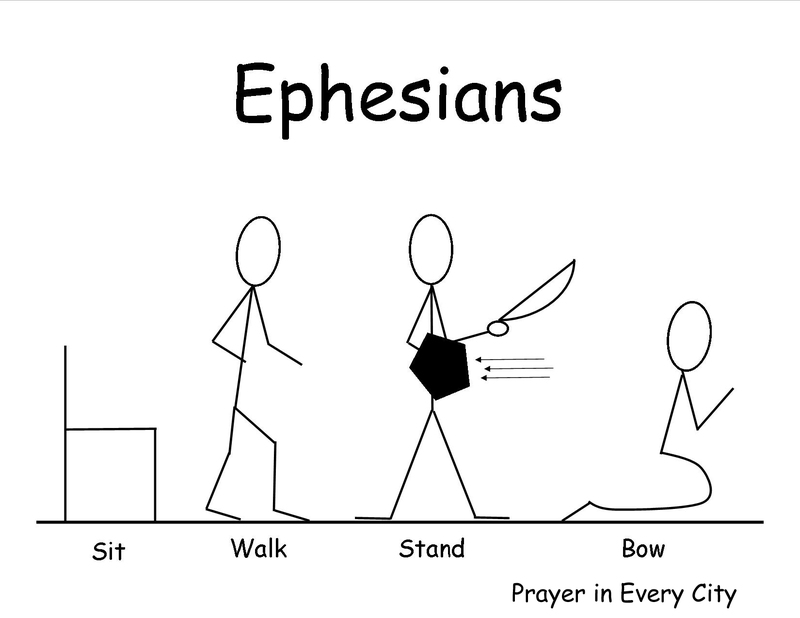 Remember that our outline for Ephesians is Sit, Walk, Stand, Bow. Here is a quick review of some of the key concepts in Ephesians. In Chapter 1 we learn who Christ is and where he is seated. “Which He worked in Christ when He raised Him from the dead and seated Him at His right hand in the heavenly places, 21 far above all principality and power and might and dominion, and every name that is named, not only in this age but also in that which is to come. 22 And He put all things under His feet, and gave Him to be head over all things to the church, 23 which is His body, the fullness of Him who fills all in all” Eph 1:20-23 (NKJV). So Christ is seated at the right hand of God in the heavenly places and he is more powerful than the principalities and powers (these are demons and Satan). In Chapter 2 we learn where we sit. “But God, who is rich in mercy, because of His great love with which He loved us, 5 even when we were dead in trespasses, made us alive together with Christ (by grace you have been saved), 6 and raised us up together, and made us sit together in the heavenly places in Christ Jesus, 7 that in the ages to come He might show the exceeding riches of His grace in His kindness toward us in Christ Jesus” Eph 2:4-7 (NKJV). So not only is Christ seated at the right hand of God in heavenly places, but we sit together with him in the heavenly places. In Chapter 4 we learn that we are to walk a certain way because we are seated with Christ. “Therefore I, the prisoner of the Lord, implore you to walk in a manner worthy of the calling with which you have been called, 2 with all humility and gentleness, with patience, showing tolerance for one another in love, 3 being diligent to preserve the unity of the Spirit in the bond of peace” Eph 4:1-3 (NASB). It might help you walk worthy if you know that you are a saint and not a sinner once you accept Christ. You can learn more about this by looking at my previous post “Love for all the Saints“. It is important to understand where you sit and how to walk, if you want to learn how to stand in the evil day. Yesterday’s post focuses on how to walk and today we will see what this walk looks like. We will begin with Ephesians 4:11-16. “And He Himself gave some to be apostles, some prophets, some evangelists, and some pastors and teachers, 12 for the equipping of the saints for the work of ministry, for the edifying of the body of Christ, 13 till we all come to the unity of the faith and of the knowledge of the Son of God, to a perfect man, to the measure of the stature of the fullness of Christ; 14 that we should no longer be children, tossed to and fro and carried about with every wind of doctrine, by the trickery of men, in the cunning craftiness of deceitful plotting, 15 but, speaking the truth in love, may grow up in all things into Him who is the head–Christ– 16 from whom the whole body, joined and knit together by what every joint supplies, according to the effective working by which every part does its share, causes growth of the body for the edifying of itself in love” Eph 4:11-16 (NKJV). Verse 11 begins with a list of spiritual gifts with a special focus on the speaking gifts. If you wish to see other spiritual gifts take a look at Romans 12 and 1 Corinthians 12, 13 and 14. I hope that you know your spiritual gifts. Some people take “spiritual gift” tests to find their gifts, but this is not a necessity. The New Testament saints were not able to take a test to discover their gifts. If you would like to know your gifts, then ask the Holy Spirit because He did not give you a gift to keep it a secret. You may need to look up the definitions to understand what they mean, but please find out. The reason God gives these gifts is given in Ephesians 4:12, which says for “the equipping of the saints for the work of service”. Then God gives a saint a speaking gift such as prophet, evangelist, pastor and teacher, he expects these people to help train the other saints in their spiritual gifts. Some of you may not have a speaking gift, but you may have a gift of service, hospitality or mercy. One of my spiritual gifts is teaching, but I lack in the gifts of service and mercy. I always like when the Lord provides people with these gifts in my Bible study because I can’t do everything. These people help plan events, send out cards, and show mercy. This helps to build our class because I can’t do it all myself and God never expected me to. When we are missing a person with a certain spiritual gift in our class, I pray for the Lord to send one. In verse 16 Paul talks about the whole body being built up. A church or Bible study functions best when all the spiritual gifts are represented. If you have a spiritual gift which you are not using, then let me encourage you do to so. Not only will you receive a blessing from the Lord for being obedient, but the body of Christ will function better as well. We have too many people in the church doing jobs which they are not called to do because there are not enough people serving. When the body of Christ functions properly and people are properly trained , then we produce mature men and women as described in verse 13. When the body of Christ becomes mature then we are no longer tossed about by false doctrine. In verse 15, Paul tells us to grow up in all aspects into Christ. Notice he puts the burden on you to grow up. The church can offer Bible studies by leaders with speaking gifts, but if the believer fails to participate then he will stunt his spiritual growth. In order for the church to body to function properly, It takes all types of believers. Those who are mature need to help the babes in Christ, but the babes need to be willing to learn. In 1 Corinthians 3 Paul has to rebuke the saints for refusing to grow up. “And I, brethren, could not speak to you as to spiritual people but as to carnal, as to babes in Christ. 2 I fed you with milk and not with solid food; for until now you were not able to receive it, and even now you are still not able; 3 for you are still carnal. For where there are envy, strife, and divisions among you, are you not carnal and behaving like mere men?” 1 Cor 3:1-3 (NKJV). I hope that you are not stuck in a state of carnality as the church of Corinth was. The body of Christ needs you. Did you know that only 15% of Millennial Generation (born 1980-2000) profess to have any type of spirituality and perhaps only 4% have salvation? Over 70% of teens will leave the church by the time they reach college. It is time that we do something about this. We need people praying, encouraging, teaching, and loving on these kids. If the body of Christ would function together properly, we could change this statistic. Please pray that the Lord will send laborers to the harvest for this generation. I can’t imagine what our society will be like when they are in charge if they don’t have Christian values. We are beginning to see the repercussions now. Please take a look at my other studies on Ephesians.